I am happy to inform my readers that today the Travelogue crossed the milestone of Two Hundred Thousand (200,000) visitors. While the first 100,000 mark was reached in 488 days, the next 100,000 mark came in just 255 days. A phenomenal increase of 191%. 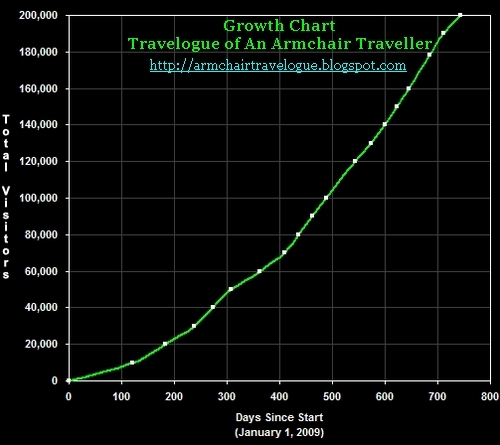 The travelogue which was started on 1st January 2009 is having a steady increase in readership with about 450-500 hits per day. Thank you all my followers and readers. Please do keep visiting. Your comments are a great source of inspiration to me. I also look forward to more comments/suggestions from my readers/followers. Encouraged by the popularity of this blog I have started another blog - Roaming The Google Streets. I hope that my followers/readers will make the new blog also as popular as the this Travelogue.